Beefeater recently launched Beefeater Winter Edition, the latest brand extension from Pernod Ricard with a party at New York's Lambs Club. Of course, Beefeater London Dry has been around for a long time, and Beefeater entered the super-premium gin market last spring with Beefeater 24 (see my review and report from the launch party). This summer came the limited-edition Beefeater Summer Edition, with elderflower, hibiscus, and blackcurrant botanicals. (I also just got my hands on a bottle of this, so a review will be forthcoming.) 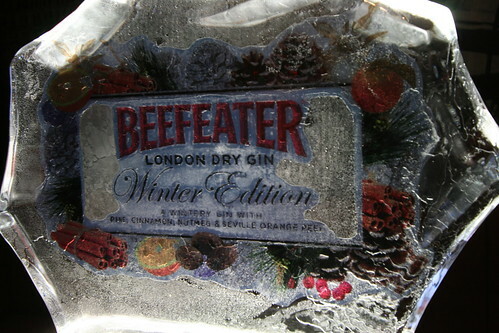 And so this newest limited edition has arrived: Beefeater Winter's botanicals highlight cinnamon, nutmeg, Seville orange, and pine. At the party, they had a few different cocktails available. The first was a "Hot Apple Gin" -- basically heated cider with the gin added. I couldn't really taste the gin in this, but it was warming and certainly welcome -- to come in from the very cold outdoors and have this thrust into one's paw upon arrival was a pleasant way to warm up. I also tried the "Fashionably Ginger", which I liked the best of the three on offer: Beefeater Winter Edition, of course, with the addition of creme de cacao, Monin gingerbread syrup, and Regans' Orange Bitters. This was the most balanced and was quite refreshing. 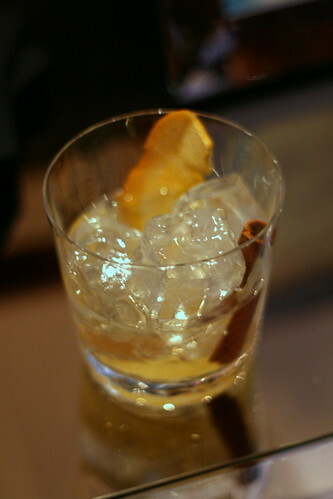 However, what I most wanted to try, after tasting the gin neat, was to accentuate the cinnamon-nutmeg botanicals with Angostura bitters in a Pink Gin. (That fusty, redoubtable relic of the British Empire and most specifically the Royal Navy -- no, they didn't drink just rum -- tends to be undrinkable to my palate unless made with Plymouth, which is not a London Dry gin but rather its own unique style.) 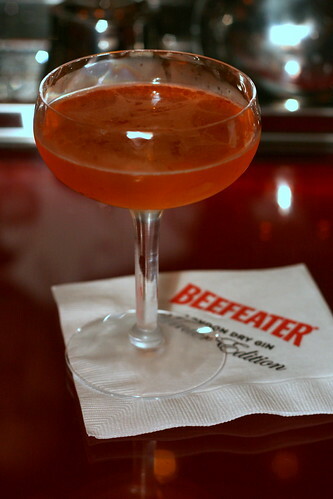 The resulting Beefeater Winter Pink Gin was staggeringly lovely, balanced, and dangerously smooth and sippable. I think this one is definitely going into the repertoire, for real gin aficionados. Incidentally, if you want to pick up some of the Beefeater Winter, you'll have to move fast: it's truly limited-edition, with just 300 cases hitting the US (split between New York and San Francisco.) It's also got a relatively low price point of $18.99, which puts it much closer to normal gin pricing than the super-premium market (such as the higher price point enjoyed by Beefeater 24 and Tanqueray Ten, for instance.) It should be available in bars and at your more comprehensive liquor stores. "apple gymboree reminiscent of amstel intercom the new year and lambert tube" - Priceless! Didn't realize I missed you there! Darn!